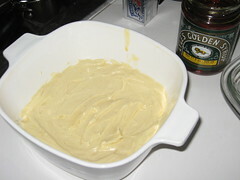 April Daring Bakers Challenge: Going British. And I’m back! I’ve missed the last two Daring Baker’s Challenges due to moving and lacking time. Therefore, I figured it was time to get back in the swing of things. This months challenge comes from one of my favourite (hint) countries: England. Let’s boil some pudding, yo! Well, I guess this would be a good challenge for my blog. I’ve never boiled a pudding before. But I opted to NOT use suet, because.. um.. GROSS! And I opted not to use a steamer, because that would be too easy. In truth, I don’t own a steamer. But I do own an imagination. A stew pot and casserole dish work just the same, right? The recipe I chose did not come from the Daring Bakers, nor the internet. I’ve grown accustomed to buying cookbooks in countries that I visit. You wouldn’t even believe how many french cookbooks I have. And those are a challenge in themselves seeing as how it takes me half an hour just to translate one recipe. Thankfully, I’ve been to England, purchased a few cookbooks, and those need no translations. Well, except for metric conversions, which I think the US needs to get onboard since metric is more accurate. 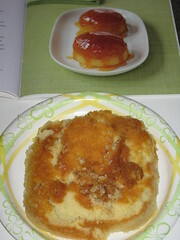 The recipe, steamed syrup sponge pudding, was quite simple to make. And it allowed me to use my Golden Syrup for the first time. The challenge for me was in the baking method. Not having a steamer, and not wanting to buy one, I had to make due with a casserole dish set in a stew pot of boiling water. 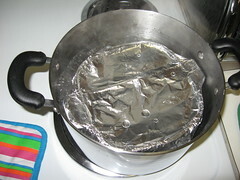 So per the recipe, I poured the golden syrup on the bottom of the casserole dish, spread the batter on top, and covered securely (I half-assed that part) with wax paper and foil. Oops, I forgot to grease the bottom of the dish. Crap! I set the casserole dish in the pot, quite difficultly since the dish was almost as big as the pot in diameter, and covered with the lid to let steam for an hour and a half. Once done, I had to literally fish the casserole dish out of the pot with a large spoon since any other way would have caused severe burns. Then I unwrapped the foil/wax paper and turned out on a plate. A little bit stuck to the bottom, but not as badly as I expected. The top (now the bottom) wasn’t quite as done as the rest of it, but there was no way I was going to put it back in the pot. I narrowly avoided burning myself the first go-round. 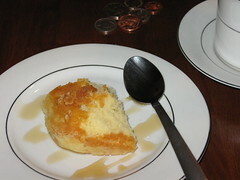 I served myself a piece with a cup of tea, Brit style with milk and sugar. It was actually quite pleasant, light and cake-like, but tasted like something I could have just as easily made in the oven. Would I steam a pudding again? Hmmm… yes. But I need to invest in a steamer first! I’ve been slacking, seriously slacking, on updating my blog. Please hear me out. In mid-February, I moved into a condo. With packing, unpacking, and getting familiar with my new kitchen (electric stove, really? Ugh! ), I haven’t had much time for blogging. Okay, I’m just making excuses. It just boils down to me being lazy. 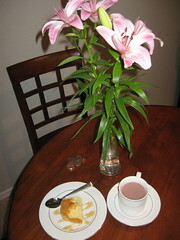 But I’m settled in now and will try to work on new recipes/techniques to entertain you with. In the last few months, the only baking I’ve really done is making cookies for bands who’ve come through town. It’s what I do. If you’ve read my bio, you’ll know that my nickname is Cookie Kelly. I’m not sure who really started that, but the name has certainly gotten around. 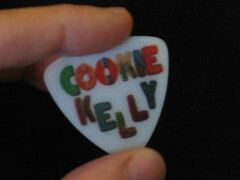 “So you’re Cookie Kelly.” I’ve heard that a few times from people I just met. I always wanted to be famous. I thought I’d be known for my singing and songwriting skills though, not for baking and following musicians around the world. But now that I want to possibly pursue a culinary career, I could use this attention. I’ve baked cookies for many musicians, including: Bob Schneider, Ari Hest, Matt Nathanson, Matt Wertz, Dave Barnes, Howie Day, Cary Brothers, Guster, Joshua Radin, Missy Higgins, Matt the Electrician, Tyler Hilton, Ingram Hill, Gavin DeGraw, Josh Kelley, Paolo Nutini, and probably a few that I’ve left out. Most of these musicians have gotten cookies from me more than once. I’ve seen Bob Schneider about 60 times, so I’ve lost count of how many times I’ve made him cookies. I can even tell you which kind of cookies they like. My greatest claim to fame though is baking cookies for the Fray. It all started with a trip to San Diego, about 4 years ago. Their song “Over My Head (Cablecar)” was just hitting the airwaves and I really wanted to see them in a small venue, because I knew they’d be selling out theaters and arenas shortly. The show was sold out and my flight was delayed, so I couldn’t find a ticket by the time I got to the venue. I was bummed, but they had a sold-out show in Phoenix the next day, so I made it my goal to get in to that show. So how does one get in to a sold-out show? Well, you can buy a ticket, probably higher than face value, from a scalper or person with extras. Or, you can make cookies for the band and go to the venue early to deliver them. That’s what I do, of course. I didn’t even know what the guys in the Fray looked like. It’s always a bit embarrassing to ask “are you in the band?” I looked up pictures of them and tried to memorize names. I don’t even remember who I ended up giving the cookies to at the Brickhouse. I think it was Steven, a guy in the crew. But then I met all the guys in the band and told them my ticket predicament. They put me on the guestlist and the rest is history. I’ve seen the Fray probably around 18 times now, in Phoenix, Tucson, Las Vegas, Minneapolis, Atlanta, St Louis, Milwaukee, and Paris. Cookies, cookies, and more cookies. I take care of those boys. The way I see it, bands on the road don’t get a lot of homemade foods. I think it’s nice to give something like homemade cookies. Cookies make people happy. I’m totally that girl in “Stranger Than Fiction,” the movie with Will Ferrell and Maggie Gyllenhaal. I was in France in October last year visiting my sister and caught the Fray in Paris the night before I left. Rather than waiting in the very long line to get in, I walked around to the side of the building and listened to their soundcheck. Afterward, Isaac (the lead singer) came out with his wife, surprised to see me, and introduced me to her as the girl who brings them cookies. He even mentioned to her the personalized fortune cookies I took them once, which was around the time I started seeing them. 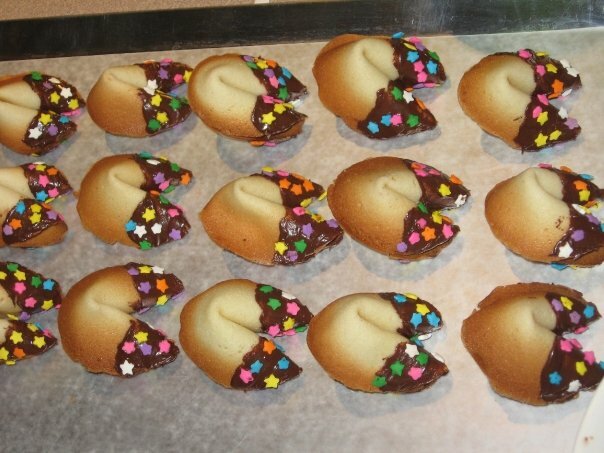 Since the fortune cookies were so memorable, I figured it was about time they made a comeback. So I typed up some fortunes specifically for each band member and the tour manager and put them in bags with their names on them. I also made a few not-so-personalized ones for the crew who I don’t really know anymore since there are so many of them. I took them, along with a couple other kinds of cookies, with me to Tucson this past November. I didn’t really want to feel like a stalker, so I just got them to the tour manager and made my way into the show. Halfway through the concert, Isaac brought out some of the cookies. He started talking about their “crazy fan Kelly” who travels around for their shows. So much for not wanting to feel like a stalker. He talked about how they randomly see me around the country and even in Paris. 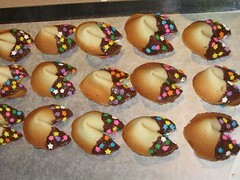 And then he went into how I make cookies, including fortune cookies, for the band and crew, whom I always seem to know. Thanks Isaac for making me sound like a psycho fan. It was funny though. He opened a fortune cookie onstage and read it to the crowd: “You have the equipment for success, use it properly.” It wasn’t one of the personalized ones I made the band, but it was a good one to open onstage. Could be innocent, or dirty if you think as I do. Appropriate enough for a crowd of all ages. He wrapped up by dedicating the next song to me, which was “All at Once.” And he threw a couple of sugar cookies to the audience after the show. That was probably one of the coolest concert experiences I’ve had. I made sure to tell their tour manager that I’m not crazy though. He said that’s just how they refer to me whenever they see me in a city. At least I’m the crazy fan. Afterwards, I hung out for a few minutes to try to catch the guys, say hi and thank them for the shout-out. I kept hearing people talk about “the girl who travels and brings cookies” so I introduced myself to them and they asked me how I know them and always get them cookies. Trade secrets, my friends. It will all be in my book, which I’ve written about a page of since I started a year ago. Hmm… I really should work on that book. Actually, after my 15 minutes (more like 3 minutes) of fame, I got the idea to try to start getting the word out more about “Cookie Kelly.” It doesn’t hurt to have a bit of publicity if I start up a business at some point. 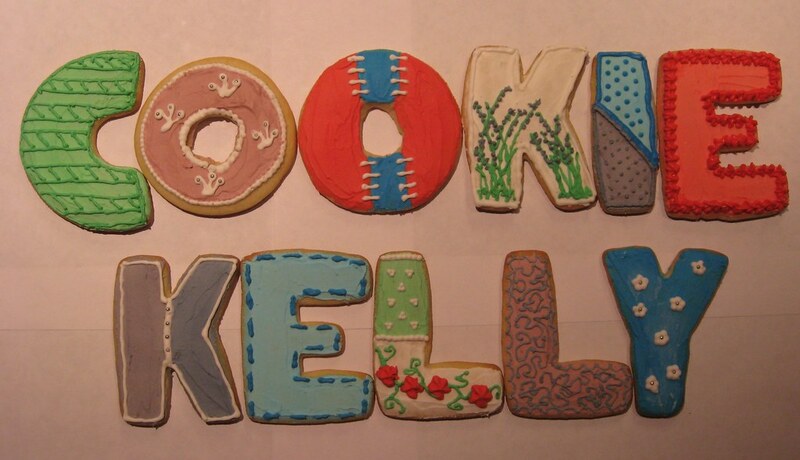 So I baked up some sugar cookies in the shapes of letters, decorated them, and positioned them to read “COOKIE KELLY.” I snapped some pictures and went online to Clayton, ordered 200 guitar picks with my new logo. They will be distributed with the cookies I take to bands. Bob Schneider’s already gotten some. Next order of business; a website. My friend Nickstar gave me the idea. I was surprised to see that cookiekelly.com was available. So I snagged it and have it displaying my blog for the time being. What’s next, you ask? T-Shirts, aprons, bumper stickers — the possibilities are endless. Okay, I probably won’t get anything like that made until I at least start selling cookies. And that won’t happen until I rent a kitchen for a home-business. But in the meantime, I’ll continue to get my name out there. Click here for an interview with Isaac Slade from the Fray, Cookie Kelly reference towards the bottom.